Join us Friday, March 31, for renowned Tuscarora singer Jennifer Kreisberg. Jennifer will be accompanied by Derek Miller & Cheri Maracle and the evening will include guest artists Kristi Lane Sinclair and the Hidden River Singers. This concert is part of our final Kwe Performance Series events for the season, and please note that the previously announced performance with Ulali Project has been rescheduled to Fall 2017 . On March 30, at the University of Toronto, Jennifer will present a free workshop at the Faculty of Music with discussions about traditional and modern Tuscarora life. She will perform and discuss hand drum songs, invite participants to join in, and answer questions. 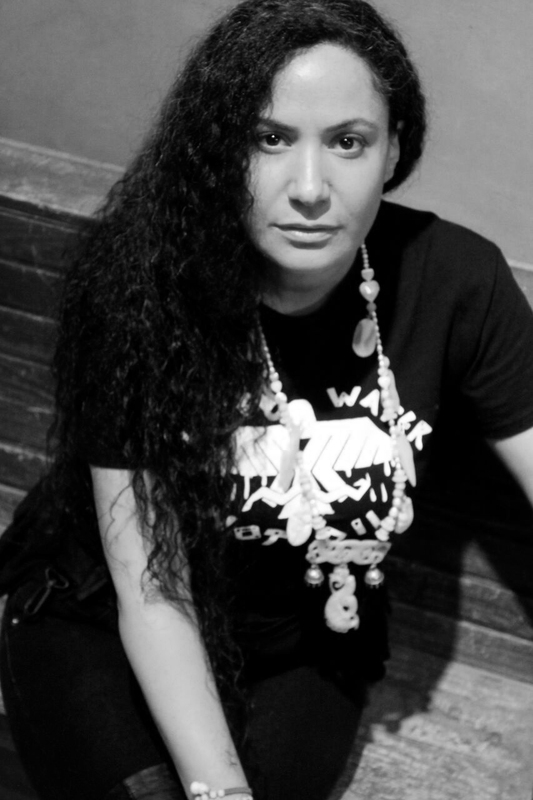 Mother, Singer, Composer, Producer, Teacher, and Activist: Jennifer Kreisberg (Tuscarora, North Carolina) comes from four generations of Seven Singing Sisters through the maternal line and has been singing since she was young. She is known for her fierce vocals and soaring range. Her lilting, breath-taking harmonies will delight your ears. Jennifer has been singing with the critically acclaimed Native women’s trio Ulali since she was seventeen. Her voice has perfectly woven the high strand of Ulali’s renowned harmony with incomparable skill, and grace for over seventeen years, helping to create a new sound in Indian Country. Adding to the group, her sharp wit and stage presence infused Ulali’s shows with strong vocals, humor and camaraderie with the audience. Jennifer was a Master Teaching Artist for the State of Connecticut Commission on the Arts for over four years. She is frequently called upon to guest lecture and conduct vocal workshops at universities, schools, Native communities and at festivals throughout the United States and Canada. She has done background vocals for various groups and voice-overs for commercials some of which feature her own compositions and highlight her production skills. Guitarist and singer/songwriter Derek Miller is a journeyman musician with eclectic taste and a knack for blues-inflected roots rock. Born on the Six Nations of the Grand River, Mohawk Territory, in Canada in 1974, Miller became interested in music in his early teens, and by the late ’90s had not only toured with iconic Canadian vocalist Buffy Sainte-Marie, but had also won a Canadian Aboriginal Music Award. In 2000 he performed on and co-produced Keith Secola & the Wild Band’s album Fingermonkey. Then, in 2002 he released his debut album, Music Is the Medicine, for which he garnered a Juno Award. Extensive touring followed his debut success, and by 2005 Miller found himself exhausted and struggling with drug and alcohol dependency. Subsequently, he entered rehab and spent the next year or so working to regain his physical, mental, and spiritual health. In 2007 he released his sophomore effort, The Dirty Looks. Cheri Maracle is a multi- award nominated Singer and Actress from the Six Nations of the Grand River Territory, Ontario. Cheri has been performing in Canada, the U.S. and Europe in the last 20 years, and has extensive music, theatre, television & film credits to her name. Cheri’s early music influences began in Women’s traditional hand drum group Tiyoweh. She then penned two original music albums, Closer To Home (2006), and If I Am Water (2013), to critical acclaim. Fierce and feisty, Haida/Cree singer-songwriter Kristi Lane Sinclair is emblematic of a new wave of Canadian indigenous artists who are turning perceptions upside down. Raised in British Columbia’s backwaters, and drawing more from a DIY/indie aesthetic than traditional or mainstream music, Sinclair’s musical roots create a darkly intoxicating mix of grunge, folk and classical. Her smoky folk is rich and orchestral, underpinned with alternately snarling guitars and warm strings. Watch her six-part documentary series airing on APTN, Face the Music follows Kristi’s journey as she releases and tours her latest album. Her latest “sonic acoustic” and forth album, The Ability to Judge Distance, will see a summer 2017 release. Michelle St. John, Rose Stella and Shandra Spears from the Hidden River Singers are some of Toronto’s best and most innovative Indigenous women singers, songwriters, actors and arts activists. They first came together during the Idle No More protests and sang to honour the life and memory of the late Misty Upham for imagineNATIVE film and media art festival 2014. They opened the “Strong Women, Strong Voices” event at the Aboriginal Pavilion during the Pan Am Games, and performed at “Maadaaizi Summer Journeys.” They have been featured at book launches for Charlie Angus, Leanne Simpson and Pam Palmater, and have performed at opening ceremonies for a number of special women’s events. Most recently, Hidden River Singers recently performed as part of the “Honouring our Families” event for the Toronto Central Regional Cancer Program. Miigwetch to all who made it out to the sold out performance for the Inuit Showcase at the Music Gallery with Kathleen Ivaluarjuk Merritt, Taqralik Partridge, and Nukariik! And to our second event in partnership with the Feminist Art Conference (FAC) at OCAD University, Sadie Buck and the Hey He Yays!